Hey guys! Whitney here… For those of you that follow us on Instagram and Facebook, you may have noticed my big news. I am expecting a new little guy here in June and we are thrilled. Thankfully, the nesting phase kicked in and I have been busy building him all the things :-)… I decided the only way to share it with y’all was to build my reveal… Here it is for those that missed it! 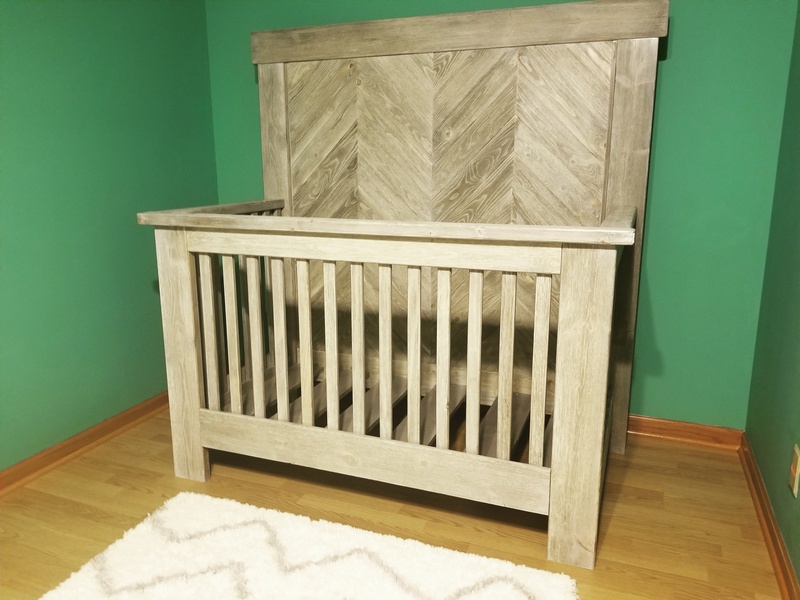 Check out my DIY Farmhouse Crib with free plans guys! Today I am sharing the plans for his crib with you guys. I felt 100% confident in my carpentry (and sanding) skills to build this. I am sharing how I built mine, and if you are comfortable enough to build your own, I hope my experience can help you out! I also designed this crib to be a low profile crib. I am only 5’2″ and I have always hated standing on my tippy toes to reach down and get the baby out. I designed this mattress to sit very low to the ground. The rails of the crib are still the required height but I dropped everything lower to customize. If you want yours to sit higher, just add the same length to each leg and line the sides and front up higher than I did. Be sure to sand the heck out of everything. No splinters! Here it is all finished up and ready in his room! Before I start, you can download and print the FREE PLANS here! First step is building the back of the crib. I used 1×6 for this part. I made all of my pocket holes using my Kreg K5 Jig. After adding all the pocket holes to secure the back, I flipped it over and started on the trim for the front. I designed it to look like a barn door and I love how it turned out! I used wood glue and 1.25″ finish nails to attach the trim pieces in place. Next, I built the frame of the back part of the crib. I noted this in the plans… I chose to rip all of my 2x boards to give them straight edges. So, the 2×6 are all 5″ wide and the 2×4 are all 3″ wide. If you choose not to do this, it won’t mess with the dimensions of everything else, but it will give your crib a slightly different finished look. I made my pocket holes on the frame pieces first. Since these are wider boards, I used 1.5″ pocket holes. 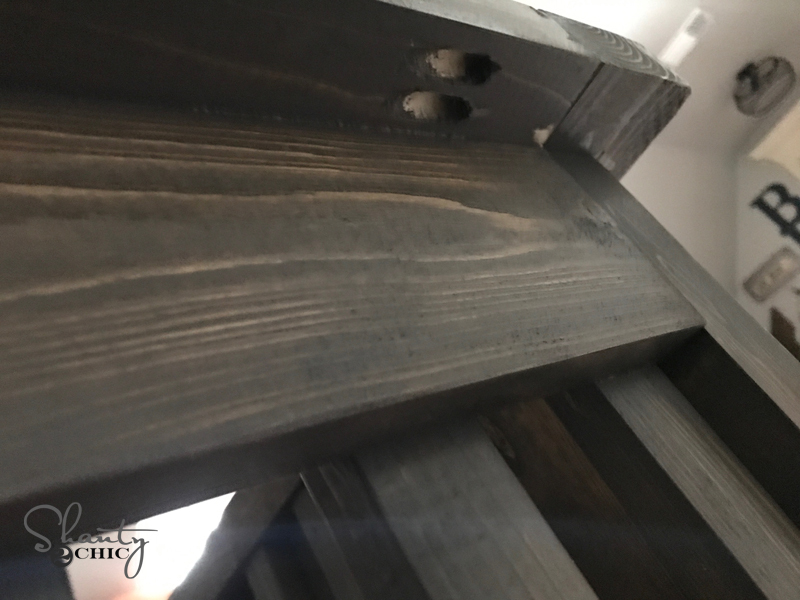 I also used 1.25″ pocket hole screws through the outside planks and the tops and bottoms of all planks to connect the planked boards to the 2x frames. Be sure to use wood glue on all the 2x joints. You can also use it between your planks but don’t get messy because you will see the glue when you stain. This alone would make a great full size headboard! Moving on to the sides. Pay close attention to measurements and spacing of pocket holes on this part because if you put them in the right place, your crib rails will cover them. I started with the top board. I measured and added all my 3/4″ pocket holes. I have noted spacing in the plans. I attached this board to the top rail piece using wood glue and pocket hole screws. Here is the opposite side of that board. This will be the outside top side of the crib. I placed my pocket holes on one side only so I would be able to access them when I assembled the crib. Here is the bottom board. I have also marked here where my slats will line up just to help me line them up straight when I nail them in. I attached this board to the outside bottom trim piece using wood glue and 1″ Spax screws. Now I attached both of these pieces I created using the crib slats. These are 1×2 boards that I nailed in place using wood glue and 1.25″ finish nails. See how the pocket holes are getting covered up! 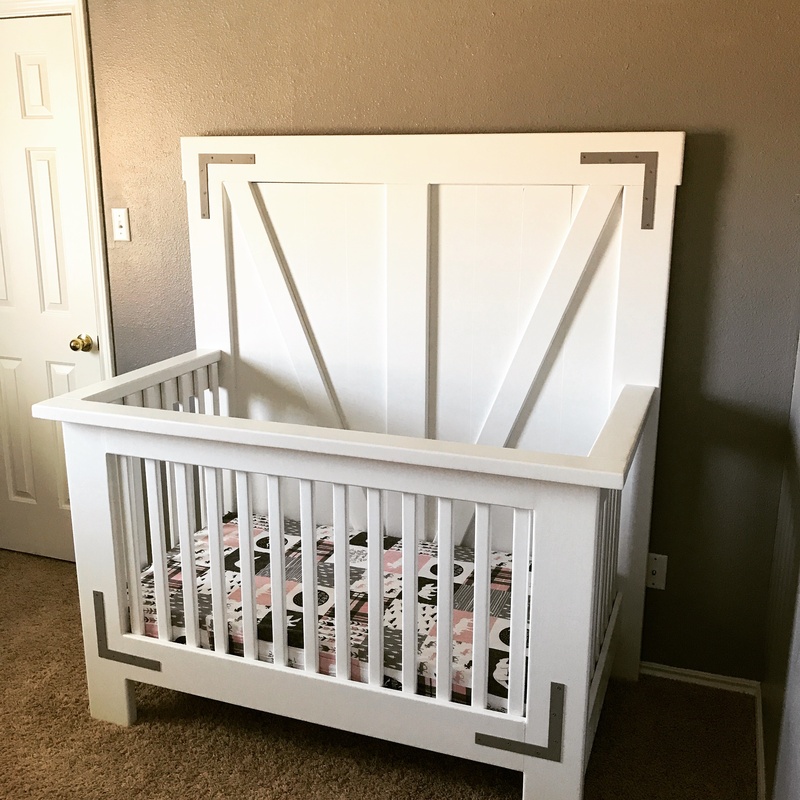 DIY Farmhouse Crib – Now for the front! I built this basically the same as the sides but it will also have the frames. I built the bottom of the front by attaching the two boards like I did the sides, and then I attached the front legs to the bottom boards using pocket hole screws. Next I made my pocket holes in my top board. Again watch your spacing on this part so that they will be covered! I attached the top board using 1.25″ pocket hole screws into the top of each leg. Next, I lined up that whole frame on top of the top front rail piece and attached it using wood glue and 1.25″ pocket hole screws. The top rail will have a 1.5″ overhang on each side…. Next I added my front slats using wood glue and 1.25″ finish nails. Watch your spacing on this part! Time for the mattress. I attached cleats to the front and the back of the crib using 2″ Spax screws. The mattress supports are 1×4 boards that sit on those cleats. After I finished building the crib, my amazing stepdad was kind enough to offer to stain this to keep me from having to do it. I gladly took him up on his offer! I chose to use Briarsmoke by Varathane and I am so pleased with the results. Speaking of stain… Did y’all catch our latest YouTube video on how to stain wood? Here it is! He also sprayed the entire crib with a polyurethane after the stain dried. Now let’s talk about that hardware… I die. Love it so much. I told our good friend Tyler of Wayne Works what I had in mind and he did not disappoint. He even rounded the edges just a bit giving them a softer look. He’s selling them guys! You can get them HERE! 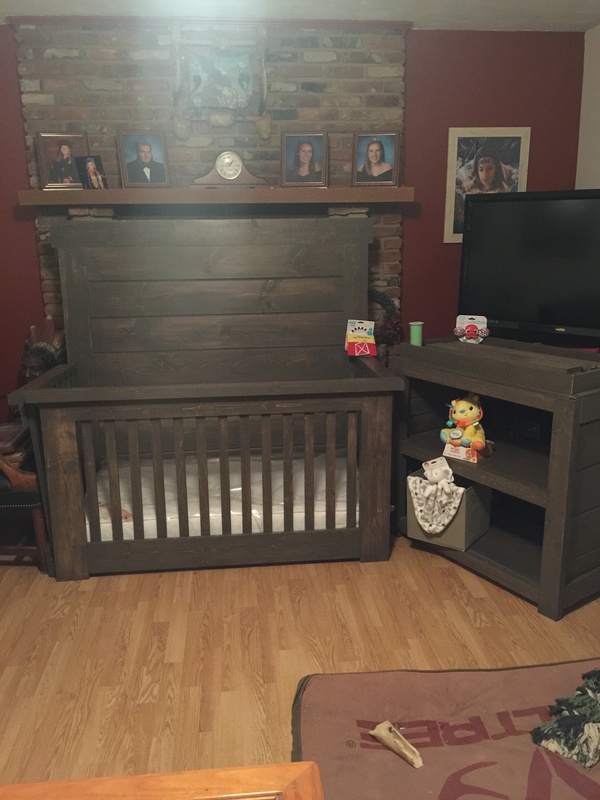 Here it is again all finished up a DIY Farmhouse Crib! I made this crib successfully 2 years ago before our baby was born. He’s ready to go into a toddler bed, any recommendations on how to take the front rail off & convert? to ride on, to motor-driven riders and miniaturized versions of popular car brands and makes which can be favored by young children, ride-on toys would continually be a section of any child’s playtime menagerie. shopping for your loved one. We are not builders but would like to purchase one of these beautiful cribs. Do you sell them? I too am curious how a standard crib mattress fits when the death of the sides are .25” shorter than all mattresses I’ve seen. I’m also having a hard time locating where I can buy the corner bracing as the Etsy shop link states they are sold out. The crib mattresses I am seeing are 52″ x 27.5″, but it looks like it will only fit a 52x 27.25″. Can anyone tell me what size mattress worked for them? What kind of polyurethane spray did you use after staining? My husband and I have been eyeing these plans for a few weeks now. My only question stems from my concern of the mattress being so low. 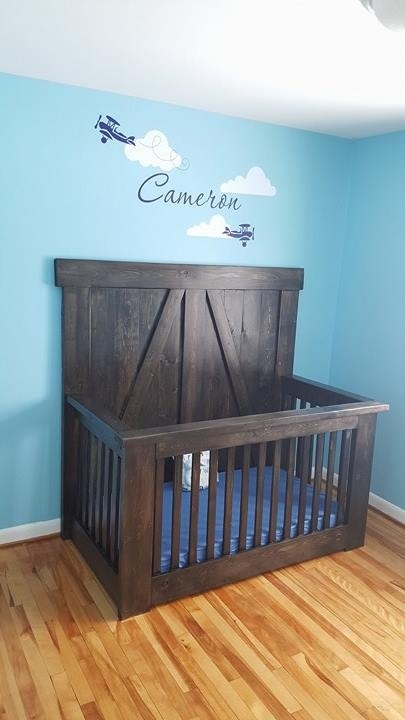 Is there a way to build this to have the mattress height be adjustable as the baby grows? I was planning on making the legs taller, as it appears some others have done, just because I like that look just a little better. However, my concern is I would have a harder time putting the baby in the crib or getting him out. Made this as a gift for a best friends baby. Plans were wonderful! A few personal preference modifications in height, joining and head board design. Feel very confident that this design is safe and stable. Highly recommend ripping each board down to make square and. However I felt a little safer roundibv each edge including rails with a 1/4 round router bit so I wouldnt be responsible for any cuts from edges haha. For finish…each peice was ran through a wire brush wheel to give a rough rustic grain feel and appeance. Sanded to 150 > stained with Briarsmoke > sanded 150 > Auntiqe White stain > sanded 150 > Antique White stain > sanded 220 > 2 coats of Shellac. I didnt really keep track of cost after 200 but I’d eatimate $300 a couple weekends. Can you share how you modified the bottom and what you change for the attachment? https://uploads.disquscdn.com/images/8efe85818b7dcd5c7a117201218eaa452972612f99432e52241ad6eb3aa74d43.jpg Just delivered this to my daughter and son in law’s baby shower for my 1st grand baby due in January I changed one thing in your design, making the back of the crib and sides of the changing table horizontal rather than vertical boards. Can anyone share a supplies list and cost? Do you have the list of supplies? We are in the process of making this beautiful crib!! We can’t figure out why our measurements aren’t working! On the crib headboard there are 9 pieces of wood that have been ripped to 5″ wide. That’s equal to 45″. The bottom board is supposed to be cut at 49 1/2″. How does that fit? We cut 3 1/2″ off the bottom board, now we’re wondering if the crib mattress will fit! You’re right! Thank you for the clarification! 😀 I guess we were just in a ripping frenzy! I really hope the crib mattress fits! It seems that you made a few alterations to the bottom, what were they? I love this crib, but had one concern in regards to bow low it is. Wouldn’t want any creepy crawlers in there with the baby as well as is it comfortable for the parents in regards to bending down to lay baby to sleep? I had a question. My friend absolutely loves this crib was gonna build it for her. However she asked if it was a convertible into toddler, day, and full bed. If it’s not do you think I could modify to make it into this? Any suggestions would be greatly appreciated! Again congrats on having a little boy!!! You could make it one by taking off the front piece. Then add another 2×6 to the front of each sidebar peices, add another bottom horizontal support for mattress and stain to match. I have a question on the mattress size. Based on your plans, the area that the mattress will drop into and rest on will be 52″ x 27.25″. It looks like this is the minimum size for crib mattresses based on what I’m seeing? Since I’m not familiar with the mattresses themselves, will any standard crib mattress be able to squeeze in? How much in total do you think this cost you to make?? In Canada, it cost me $57 worth of wood. I have an airstrike brad nailer, do you think 1.25in brad nails would work for attaching the trim on the headboard instead of finish nails? I guess I could do the finish nails by hand (just takes longer). Also, for mine, I’m going to make the bed height adjustable by using connector bolts and instert nuts. I’ll post a pick when I’m done. hi! i love the crib but i do have one question. Are you able to convert this into a toddler bed with the headboard and footboard? if so how would you do that? 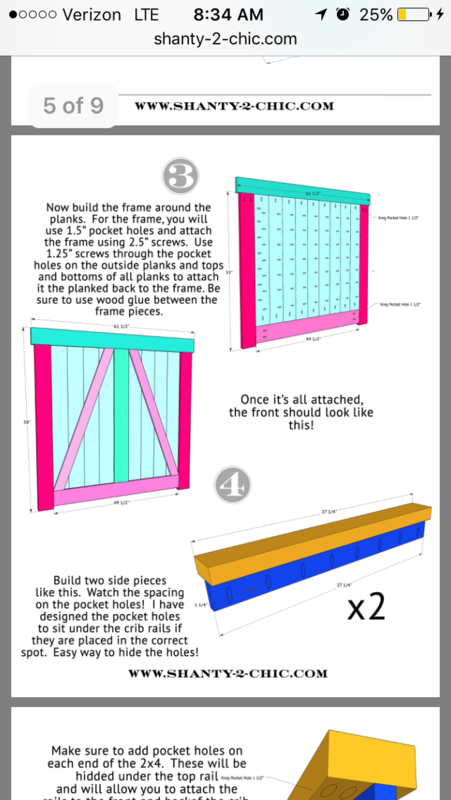 I think this could be converted fairly easily with a few modifications to how you construct the crib front. I’m actually a considering this as I build one right now. My thoughts are to use threaded inserts and connector bolts vice pocket hole screws to connect the crib front to the side rails. This will allow the crib front to be removed as a solid piece to allow for future installation of a toddler rail. For the toddler rail, it will need the stability of the legs that are designed into the crib front, so I think I can follow the directions for the crib front (steps 7-9), and modify it so instead of installing the upper rail 30in high, add a lower guard rail approx 20in high with an opening of approx 16in to allow the little guy to climb in and out of bed. Only downside I can see, is that this makes a large piece to store when not being used. Luckily I have some time to design and build this since I won’t need to convert this for another 18mo.